Environmental monitoring with SensorHawk Liquid Detection Sensors from Enviromon. Our base units and smart sensors provide 24/7 monitoring and data logging for environmental conditions such as liquid detection and can alert you by email or SMS immediately as a liquid is detected. 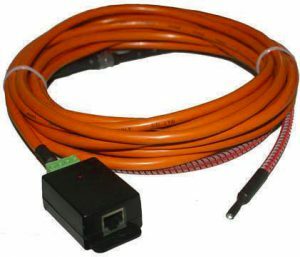 Ideal for use in basements and under false floors and roof spaces, the Rope Water sensor can cover a large area. Combined with any of the SensorHawk series or SecurityHawk series units it will give you advance notice of any water leaks or flooding. The sensor will retain it’s error condition until it is read via an SNMP get. Therefore if the sensor encounters a critical condition at anytime it will report that condition before it returns to a normal state. In power monitoring situations where backup battery and UPS are used to ensure constant power supply there is a risk of battery’s leaking harmful battery acid. Use this rope sensor underneath backup battery banks to give advanced warning of battery acid leaks. By using the SecurityHawk Fuel Level sensor you can ensure that your fuel tanks are filled and ready for the most critical moments. 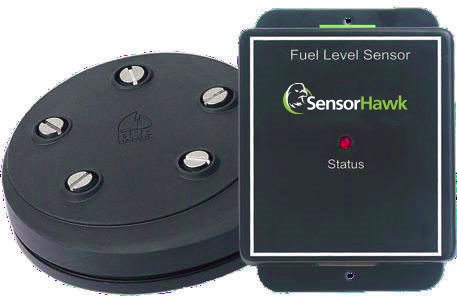 The SecurityHawk Fuel Level Sensor is a liquid level detector that will monitor the level of liquid in a tank and display this level on the SecurityHawk 5E’s web interface and send alerts accordingly. 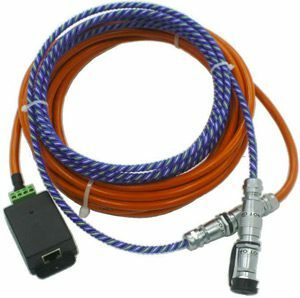 The RJ-45 intelligent sensor port on base unit powers the sensor. It is compatible with any of the SecurityHawk series units, or the SecurityHawk 8 expansion modules. You can instantly be alerted should there be any drop below critical levels in your fuel. Advance alerting, including an additional feature that alerts you if you tank level is dropping too quickly, protects you from possible fuel leaks or theft and ensure your tanks never run dry again. The sensor assembly incorporates an advanced tank sender based on the ultra sonic measurement technology and can monitor a variety of liquids in many types of tanks. These tank level thresholds can then be linked to the advanced notification alerts on the SecurityHawk 5E’s web interface. This sensor is designed for monitoring levels of water, diesel, petrol fuel and waste tanks. These tanks can be in linear and non-linear sizes as they are easily calibrated from a simple wizard that is run from the SecurityHawk 5E’s web interface. Linearization parameters are used to adjust the measurement accuracy for non-linear fuel tanks. For example a fuel tank is non-linear if the tank height is not proportional to its capacity. The low profile design and standard SAE 5 hole mounting pattern make it easy to install and setup and it has no moving parts for long lasting functionality. Industry standard SAE-5 stud mounting pattern with gasket seal and washers.